The wallpaper hanger just left and I just couldn't resist sharing some pics! I LOVE IT! But those are easy & fast fixes.. hope to be done very soon! That looks fantastic. Absolutely love it! Oh, how fun! I know you are excited! So jealous! I'm dying for grasscloth on an accent wall in my dining room. It looks really great. What a lovely finish! Looking forward to seeing it all finished and looking brilliant! I don't blame you for not being able to wait. It's beautiful. Can't wait to see the room finished! The wallpaper is gorgeous and I love that mirror! Fun! I'm curious, does grasscloth show seams normally? Is there no getting around it when using? yup! No way around it. Love! Have you seen blue grasscloth? I really want some in my bathroom! Very exciting!! It's going to be really lovely Bryn! 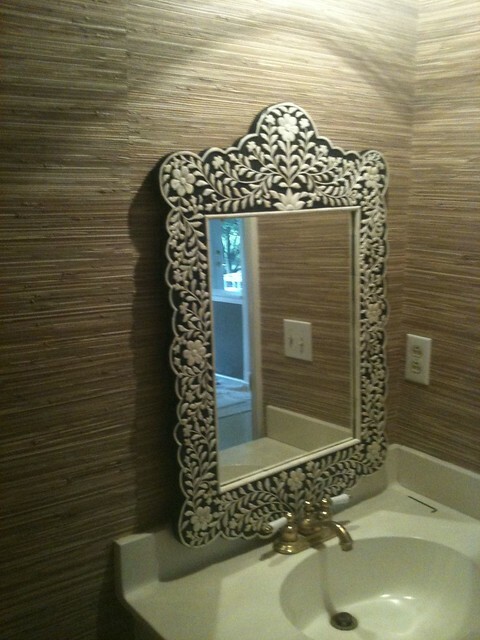 I have been wander-lusting about this mirror for a billion years and I am completely JEALS!!!! What a bathroom this is gonne be.....can not wait for the proper after photos! Love the wallpaper, Bryn. Can't wait to see it all finished ! LOVE your mirror, Bryn! And the wallpaper looks fab. It adds such a nice dimension to the space. Such progress!! It looks really good. Loving it! So exciting, I'm sure, to have made this much progress. It's going to be great!! Looks great! I will definitely be using grasscloth somewhere in my home! 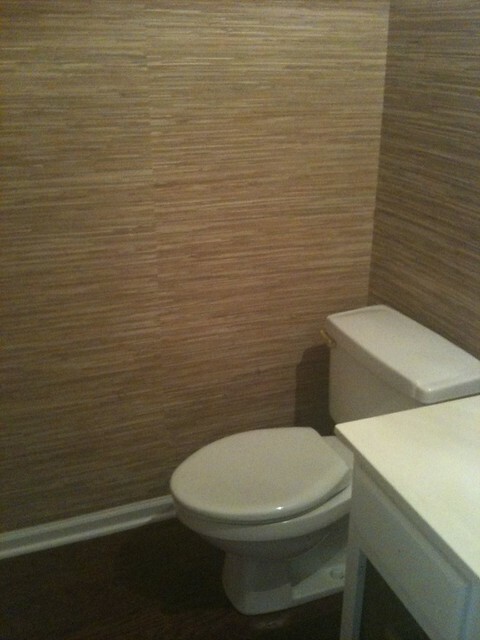 love grasscloth in powder rooms and water closets. looks great, Bryn! New to blogs....love yours! Great ideas and gorgeous pics!